YOUR FINAL PRICE, INCLUDING SALES TAX & UPS GROUND SHIPPING TO A COMMERCIAL ADDRESS!! 250 cards (minimum) @ $47.30 • 500 cards @ $57.81 • 1000 cards $73.57 • 2500 cards @ $131.58. Our Prices INCLUDE Tax and Shipping) "Don't settle for less. Make a GREAT impression." ORDER LARGER QUANTITIES AND SAVE!! ALL ORDERS WILL RECEIVE A VIRTUAL PROOF BY EMAIL WITHIN 24 HOURS (M-F). Product ships 2 - 4 days from final art approval, plus 2 days UPS shipping. Price shown includes:- 14 point card stock - Full Color Back-printing (Stock Layouts) - Your choice of 'Dull/Matte Finish' on both sides of the card; 'UV Gloss Coating' on the front of the card only or 'UV Gloss Coating' on both sides of the cards. Your choice, all the same price. (We do recommend the Gloss Finish on the front of Black Background card styles creating a Rich Black color, but either finish will provide a truly professional look.) The Dull/Matte finish will allow you to write on the card. (With a Front UV Gloss Coating the back of card is left uncoated and may also be left blank) - Custom Card Backs are available for an additional design charge (minimum $35.00). 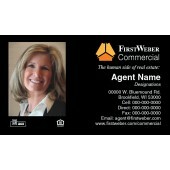 We will work with you to customize the back of your card and make it your own. 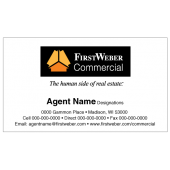 (Custom Backs may be subject to Corporate Approval) - Changes to the approved front of card layouts may need to be approved by your Corporate office and will most likely incur additional set up fees (minimum $35.00 charge). 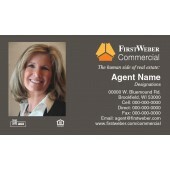 QR Code back-print styles are available on order quantities of 500 cards or more. - When entering your card information, please make sure spellings, phone numbers, email address, web address, etc. are accurate & complete; including Back-print Style. Cost of the cards include up to 2 proofs; additional proofs may incur a $10.00 charge, per additional proof. (Submitted Photos must be meet our minimum photo quality standards. Photos taken by a professional photographer work best! For more information Select 'Photos & Uploads' at bottom of this page). Email your photo to photos@hysmp.com as soon as possible. Styles with silhouette photos will incur a $15.00 cropping fee, in addition to the cost of the cards. This is a one-time charge, per photo cropped. Future orders using the same silhouette photo will not incur this charge. controlled by our suppliers, pricing and specifications shown are subject to change or correction at time of order placement. If there are inaccuracies, we will notify you as soon as possible. We apologize in advance for any problems this may cause.